Many consumers of Jatropha tanjorensis leaves claim that the leaves are nutritious and in addition, possess nutraceutical properties that promote good health. Such claims can be misleading since there is no scientific data to validate their claims. This study evaluated the nutritional and antioxidant properties of the aqueous extract of Jatropha tanjorensis leaves in carbon tetrachloride induced male Wistar albino rats with the aim of validating some nutritional and nutraceutical properties claimed by local consumers. Anti-nutritional factors, vitamins, proximate and mineral compositions were determined using standard analytical protocols. Acute toxicity and antioxidant properties were investigated with 18 male mice and 30 male Wistar albino rats respectively. The data obtained were statistically analysed using one-way analysis of variance. Anti-nutritional analysis revealed presence of alkaloids and phytate in relatively high amounts while glycosides and tannins were undetected. The leaves have nutritionally good proximate composition. High vitamin A, low vitamins B1 and C and undetectable level of vitamin E were also observed in the leaves. Relatively high amount of sodium (402.20 ± 1.97 ppm) and iron (50.67 ± 0.76 ppm) were observed. Acute toxicity study revealed the relative safety of the aqueous extract as no mice exhibited signs of toxicity or death after 24 hours of oral administration. The CCl4 induction caused significant (p<0.05) decrease in antioxidant enzymes activities when compared with the normal control, however, treatment with graded doses of the extract resulted in significant (p<0.05) dose dependent increase in catalase, superoxide dismutase and glutathione peroxidase activities and significant (p<0.05) dose dependent decrease in malondialdehyde concentration when compared with the positive control. It is concluded that the leaves are nutritionally rich and possess antioxidant properties that could effectively ameliorate oxidative stress; however, excessive consumption may impair bioavailability of some nutrients due to high phytate content. Jatropha tanjorensis leaves, Anti-nutrients, Nutritional compositions, Carbon tetrachloride, Anti-oxidative stress. The growth of traditional medicine has long been attributed to ever increasing medicinal plants rich in pharmacologically active components with proven efficacy against some wellknown diseases and medical conditions . Use of traditional medicines in treatment and management of various disease is now encouraged by World Health Organisation (WHO) due to their readily availability, cost effective and high potency against some diseases . Many traditionally known medicinal plants studied in the last few decades have been reported to possess various medicinal properties such as anticancer activity, antioxidant activity, anti-inflammatory, anti-diabetic, antibacterial, antifungal and hepato-protective activities . Medicinal plants are key sources of bio-active compounds for herbal medicine, antibiotics, antioxidants, and pharmaceutical drugs . There is virtually no plant on earth without any health benefit; however, there are many plants with yet to be discovered health benefits. Their bio-active constituents can be used in whole or as extracted forms for the management of ailments due to the available findings that they possess little or no side effects, readily available and can protect humans against many diseases . Jatropha tanjorensis is a perennial herb that belongs to the family Euphorbiaceae whose common name includes: catholic vegetables, Jatropha, ‘Hospital too far’, lapalapa and Iyana ipaja in Yoruba language . The leaves are employed traditionally in the treatment of anaemia, diabetes and cardiovascular diseases . It is a traditionally used medicinal plant in South-Eastern Nigeria with many claims from local consumers that it possesses blood replenishing properties . It has been reported that Jatropha leaves are rich in beta blockers, anti-cancer agents, anti-anaemic, anti-microbial activities, anti-plasmodial and anti-oxidant effects against oxidative stress induced by malaria parasite [7,8]. Although, studies have been carried out on J. tanjorensis, none of such researches have addressed the antioxidant potentials of lyophilized aqueous extract of Jatropha tanjorensis leaves. Most local consumers consume the aqueous extract of J. tanjorensis for its health benefits while researchers have provided scientific data from either methanol or ethanol extracts to support or counter claims from local consumers . The generation of free radicals has been shown to be the mechanism of CCl4 induced oxidative stress or hepatotoxicity. That is CCl4 when metabolized by cytochrome P-450 yields a reactive metabolite, trichloromethyl radical (CCl3 *) which initiates a cascade of free radical reactions resulting in an increase in lipid peroxidation and a reduction in some antioxidant enzymes activities . A number of studies have shown that plant extracts having antioxidant activities protect against CCl4 induced oxidative stress and hepatotoxicity by inhibiting lipid peroxidation and enhancing antioxidant enzymes activities . In this study, nutritional and antioxidant properties of lyophilized aqueous extract of J. tanjorensis leaves in CCl4 induced male Wistar albino rats was investigated to validate some claims by local consumers on the nutritional and antioxidant properties of the J. tanjorensis leaves to ensure optimal utilization of the plant leaves for human benefits. J. tanjorensis leaves were collected from Woji in Obio-Akpor Local Government Area of Port-Harcourt, Rivers State, Nigeria and identified by Mr. Alfred Ozioko of the Bioresources Development and Conservation Programme (BDCP) Research Centre Nsukka, Enugu State, Nigeria. 18 male Wistar albino mice weighing 25-35 g were used for the acute toxicity (LD50) study and thirty male Wistar albino rats weighing 125-160 g were used for the investigation of anti-oxidant properties of J. tanjorensis leaves against oxidative stress caused by CCl4 induction respectively. The animals were purchased from the Department of Zoology and Environmental Biology, Faculty of Biological Sciences, University of Nigeria, Nsukka, acclimatized for 7 d, fed standard grower feed, and allowed free access to drinking water ad libitum. Fresh J. tanjorensis leaves were dried under shade within a temperature range of 26-28°C and ground into fine powder with an electric blender. A quantity, 653.81 g of the finely ground sample was macerated in 2.5 L of distilled water in a sterile clean plastic container for 24 h after which it was filtered with Whatman No. 4 filter paper into a clean volumetric flask. The filtrate was lyophilized, weighed and stored in desiccators. Thirty male Wistar albino rats were randomly distributed into 6 groups of 5 rats each with group 1 as the normal control that received only distilled water. Group 2 served as the positive control that was CCl4 induced but not treated, group 3 as the standard control that was CCl4 induced but treated with 200 m/kg b. wt. of vitamin C. Groups 4-6 were CCl4 induced and treated with 100, 200 and 400 mg/kg b. wt. of lyophilized aqueous extract of J. tanjorensis leaves respectively. The extract was administered to the rats orally with gavage tube every 24 h for 14 d. Blood samples were collected into plain tube to assay for the selected antioxidant enzymes and lipid peroxidation product on the 15th d and the rats were sacrificed. The guide for the care and use of laboratory animals’ procedures were followed in this study . Oxidative stress was induced with carbon tetrachloride (CCl4) in olive oil as a vehicle. The two liquids were mixed in the ratio of 2:1 (2 ml of carbon tetrachloride and 1 ml of olive oil) and administered by intraperitoneal injection of a single dose of 10 ml/kg body weight of the rats. The rats were allowed to stay for 72 h after administration of CCl4 without any treatment to allow the establishment of significant oxidative stress. The qualitative anti-nutrients analyses were conducted using the methods of Harborne et al. [12,13]. Alkaloids, saponins, oxalate and cyanide contents were determined according to the methods described by Harborne . Total phenol, and phytate contents were determined as described by the methods of Velioglu et al. [14,15]. The crude fibre, crude protein, moisture and ash content of the J. tanjorensis leaves were determined using the methods described by AOAC . The soluble carbohydrate was calculated by difference. The concentration of vitamin B1 (riboflavin) was determined using the method of scalar . Vitamins A, C and E were determined using the methods described by Pearson . The sample was digested as described by the method of Falade et al., and mineral contents were analysed by Atomic absorption spectrophotometer (ALPHA 4 model, Fisons Chem- Tech, Analytical, UK) . The acute toxicity study of the lyophilized aqueous extract of J. tanjorensis levels were carried out according to the method described by Lorke . The catalase activity was assayed according to the method described by Aebi . Principle: The principle of assaying catalase activity using this method is based on the measurable ultraviolet absorption of hydrogen peroxide at 240 nm. Decomposition of hydrogen peroxide by catalase activity leads to decrease in absorption of hydrogen peroxide absorption at 240 nm. The observed decrease in absorption of hydrogen peroxide with time is proportional to catalase activity. The superoxide dismutase activity was assayed according to the method of Xin et al. . Principle: The superoxide dismutase activity is determined using this method due to the ability of superoxide dismutase to inhibit the autoxidation of adrenaline. Superoxide generated by the xanthine oxidase reaction causes oxidation of adrenaline to adrenochrome. The concentration of adrenochrome produced per superoxide introduced increases with pH and also with increasing concentration of adrenaline. The glutathione peroxidase activity was assayed using the method of Ursini et al. . Principle: Glutathione peroxidase catalyses the oxidation of reduced glutathione (GSH) by cumene hydroperoxide. In the presence of glutathione peroxidase and NADPH, the oxidized glutathione (GSSG) is immediately reduced to GSH and simultaneously oxidizes NADPH to NADP+resulting in decrease in NADPH absorbance at 340 nm. The decrease in absorbance of NADPH at 340 nm is proportional to glutathione peroxidase activity. Lipid peroxidation was determined spectrophotometrically by measuring the level of the lipid peroxidation product, malondialdehyde (MDA) as described by Wallin et al. . Principle: The principle for this method is based on the reaction of thiobarbituric acid (TBARS) with malondialdehyde (MDA) to give a red or pink colour, which absorbs maximally at 532 nm. The data obtained from the experiment were expressed as mean ± standard deviation using One-Way Analysis of Variance (ANOVA). Acceptable value of p<0.05 was considered to be statistically significant. The Statistical Products and Service Solutions (IBM Statistics SPSS 20 SPSS) software version 20 was used for this analysis . The qualitative and quantitative anti-nutritional analyses of J. tanjorensis leaves respectively which indicate that alkaloids are the major anti-nutrient constituent of J. tanjorensis leaves followed by saponins, phytate, flavonoids, phenolics, cyanide and oxalate in their decreasing order of concentration as shown in Tables 1 and 2. KEY: -: Absent; +: Present in low concentration; ++: Present in medium concentration; +++: Present in high concentration. Table 1. Qualitative anti-nutrient content of J. tanjorensis leaves. Values are presented as mean ± standard deviation (n=3). Table 2. Quantitative anti-nutrient contents of J. tanjorensis leaves. The result of the proximate analysis (Table 3) revealed that apart from carbohydrate, the J. tanjorensis leaves have high levels of crude fibre, fat and oils, and ash content while its moisture and protein content are low. Values are mean ± standard deviation of triplicate determination (n=3). Table 3. Proximate composition of J. tanjorensis leaves. Analysis of selected vitamins in J. tanjorensis leaves showed that vitamin A (48.215 ± 2.790 mg/100 g) had the highest concentration. Vitamins B1 (0.0201 ± 0.001 mg/100 g) and C (0.0347 ± 0.000 mg/100 g) occurred at low concentrations, while vitamin E was not detected (Table 4). Table 4. Vitamins composition of J. tanjorensis leaves. The results of the mineral analysis J. tanjorensis leaves in Table 5, show that sodium is the most abundant mineral, followed by iron, copper, manganese in decreasing order of concentration with molybdenum as the least abundant mineral in the leaves. Table 5. Mineral content of J. tanjorensis leaves. After the extraction of 653.81 g of dried sample of J. tanjorensis leaves with 2.5 L of distilled water, a percentage yield of 4.68% (31.78 g) was obtained after lyophilisation of the aqueous extract. The result of the acute toxicity study of the aqueous extract of J. tanjorensis leaves in Table 6 showed that the extract caused no death or adverse reactions in the mice within and after 24 h of the administration of various doses of the extract even at the highest dose of 5000 mg/kg b. wt. Table 6. Acute toxicity study of aqueous extract of J. tanjorensis leaves. 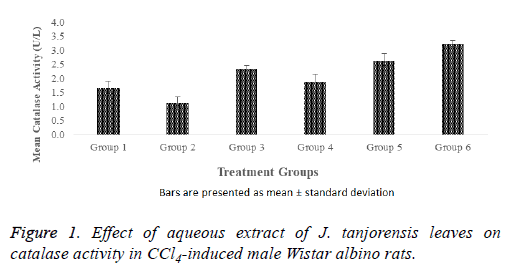 The effect of aqueous extract of J. tanjorensis leaves on catalase activity in normal and CCl4-induced male Wistar albino rats as shown in Figure 1. The CCl4-induced groups 4, 5 and 6 treated with 100, 200 and 400 mg/kg b. wt. of the extract respectively showed a dose dependent significant (p<0.05) increase in catalase activity were observed when compared to group 2 (untreated CCl4-induced rats) that served as the positive control. The catalase activity of the positive control (group 2) was significantly (p<0.05) lower when compared with catalase activity of the normal control (group 1). However, it was observed that there were non-significant (p>0.05) increase in the catalase activity of groups 3 and 4 rats when compared with the normal control while significantly (p<0.05) increased catalase activity were observed in groups 5 and 6 when compared with the normal control. Figure 1:Effect of aqueous extract of J. tanjorensis leaves on catalase activity in CCl4-induced male Wistar albino rats. The positive control (group 2) had significantly (p<0.05) lower superoxide dismutase activity when compared with the normal control (group 1) as revealed by Figure 2. It also showed that there was no significant (p>0.05) decrease in the SOD activity of the standard control (group 3) treated with vitamin C when compared with the normal control rats. The CCl4-induced rats in groups 4, 5, and 6 treated with 100, 200, and 400 mg/kg b. wt. of the aqueous extract of J. tanjorensis respectively showed no significant (p>0.05) decrease in SOD activity when compared with the normal control and had dose dependent increase in the SOD activity when compared with the positive control. 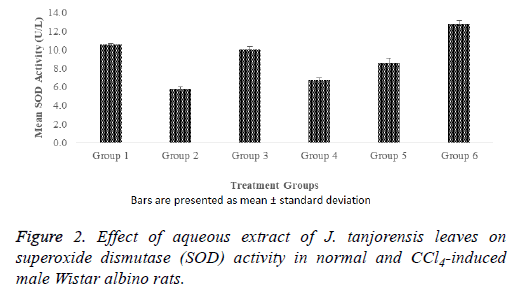 Figure 2: Effect of aqueous extract of J. tanjorensis leaves on superoxide dismutase (SOD) activity in normal and CCl4-induced male Wistar albino rats. 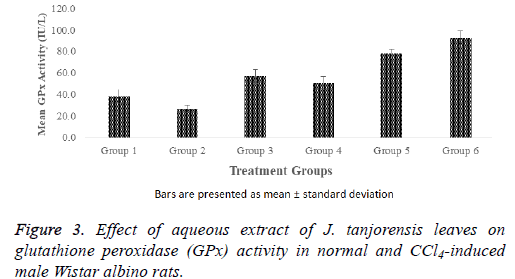 The effect of aqueous extract of J. tanjorensis leaves on glutathione peroxidase (GPx) activity in normal and CCl4- induced male Wistar albino rats as shown in Figure 3. There were significant (p<0.05) increase observed in GPx activity of groups 4, 5 and 6 when compared with the normal control. However, the GPx activity of the positive control (group 2) was significantly (p<0.05) lowered when compared with the normal control and the groups treated with various doses of the aqueous extract and standard control respectively. Figure 3: Effect of aqueous extract of J. tanjorensis leaves on glutathione peroxidase (GPx) activity in normal and CCl4-induced male Wistar albino rats. There were significant (p<0.05) increase in MDA concentration of the positive control when compared with normal control group as observed in Figure 4. The result further showed significant (p<0.05) increase in the MDA concentration of the standard control (group 3) when compared with the normal control. However, groups 4, 5 and 6 that were CCl4 induced but treated with 100, 200, and 400 mg/kg b. wt. of the aqueous extract respectively showed significant (p<0.05) decrease in the MDA concentrations in a dose dependent manner when compared with the positive control group. Groups 4, and 6 exhibited significant (p<0.05) increase and decrease respectively in MDA concentrations when compared with the standard control. Figure 4: Effect of the aqueous extract of J. tanjorensis leaves on MDA concentration of CCl4 induced male Wistar albino rats. This study evaluated nutritional and antioxidant potentials of aqueous extract of J. tanjorensis leaves using carbon tetrachloride induced male Wistar albino rats. Free radicals are known to be associated with many diseases and disorders such as neurodegenerative diseases, cancer and liver damage. Carbon tetrachloride (CCl4) is potent hepatotoxic agent commonly used for the induction of liver damage in experimental animal with free radical generation as its most acceptable mechanism of action . Thus, both endogenous and exogenous antioxidants could scavenge free radicals generated by these hepatotoxic chemical and other xenobiotics with similar mechanism of action and prevent oxidative stress and its associated adverse health effects. The high levels of anti-nutritional factors obtained from the qualitative and quantitative anti-nutritional analyses of J. tanjorensis leaves indicated the richness of the leaves in important pharmacologically bioactive compounds which could confer some health benefits to those who consume them in right quantity but could affect the bioavailability of some nutrients most especially minerals as they could bind or complex with them and make them non-bioavailable, if consumed in excess. The high levels of alkaloids, and phytates, and relatively low levels of saponins, cyanides, oxalates, and phenols observed in this study with known health promoting effects are in agreement with the findings of Arun et al. [27,28]. Plants rich in alkaloids are used in treating stomachs ache, vomiting, intestinal worms, constipation, dysentery and diarrhoea . Phytate functions as a chelating agent and also an anti-oxidant capable of suppressing oxidative reactions catalysed by iron in a living system and in like manner saponins reduce the uptake of glucose and cholesterol by intralumenal physicochemical interaction at the gut thereby ameliorating adverse health effects associated with hyperglycaemia hypercholesterolemia in diabetic patients . Kahkonen et al. reported that the concentrations of total phenolics in food are used as one of the major determinants of antioxidant potentials of food from plant sources . However, cyanide, and oxalate could be toxic to the body when they are present in high concentrations but could be easily detoxified into harmless metabolites and excreted out of the body. The presence of these bioactive compounds in moderate concentrations is of great advantage as their health benefits could be maximized without experiencing their toxic effects as much of these compounds will be lost through processing. The high levels of the mineral contents recorded in this study suggest that the leaf extract is rich in important micronutrients which could prevent micronutrient deficiency in individual who consume the plant leaves in right proportion. Sodium and molybdenum were found to be the most abundant and least abundant cations respectively contrary to the findings of Arun et al., who reported that iron and sodium were the most abundant and least abundant mineral J. tanjorensis leaves respectively . The observed difference could be due to the difference in soil nutrient, and geographical locations of the plants which may have affected the uptake of these minerals from soil. All these minerals play vital roles in maintaining electrolyte balance within and between intracellular and extracellular environment including functioning as cofactor for enzymes that require them for their normal catalytic activities. The proximate composition recorded in this study showed that J. tanjorensis leaves are nutritionally rich with high ash content that suggests its richness in mineral elements, thus, consumption of this plant leaves in right proportion could help in the prevention of micronutrient deficiency. The low moisture content in J. tanjorensis leaves indicates that the leaves have long shelf life due to the ability of low moisture to delay microbial and biochemical activities leading to spoilage while the low protein content suggests that the leaves could be poor protein source unless amino acid analysis showed that it is rich in essential amino acids. The high level of crude fibre content indicates that the plant leaves are good source of the crude fibre which confers some health benefits such as healthy colon, anti-hypercholesterolemia, efficient digestion and rapid bowel movement in individuals who consume them. Although, carbohydrate is the major proximate constituent, individuals consuming this leaves may not obtain the required quantity and must consume other major carbohydrate sources to meet the energy need as leaves generally are not good sources of carbohydrate. The leaves also have high fats and oil content which could be of economic importance if they are rich in essential oils. The acute toxicity (LD50) study of the aqueous extract of J. tanjorensis leaves indicated that the plant leaves are relatively non-toxic as no mortality or adverse reactions were recorded in groups of mice treated orally with graded doses of the aqueous leave extract, even when 5000 mg/kg b. wt. was administered. Thus, it could be inferred from this finding that the lethal dose (LD50) for the plant extract lies above 5000 mg/kg body weight and suggests the high tolerance and safety level of the plant extract within the administered doses. The observed high safety level of plant extract is consistent with the findings of Igbinaduwa et al. who independently evaluated acute toxicity of aqueous and methanol extract of J. tanjorensis respectively and reported no death or any adverse reactions [32,33]. There are accumulating data showing that carbon tetrachloride (CCl4) induces oxidative stress through generation of highly reactive trichloromethyl radicals (CCl3 *) and trichloromethyl peroxy radical (CCl3OO*) that cause lipid peroxidation and subsequent tissue damage . Administration of CCl4 leads to the generation of a peroxy radical, which is associated with inactivation of catalase and glutathione peroxidase leading to their decreased activities in conditions of oxidative stress . This probably explains the significant (p<0.05) decrease in catalase (CAT), superoxide dismutase (SOD) and glutathione peroxidase (GPx) activity observed in rats challenged with CCl4 in this study. The reduced activity of these enzymes could be attributed to the scavenging actions of these enzymes on radicals produced by CCl4 during oxidative damage and lipid peroxidation. Reduced activities of the antioxidant enzymes could also be due to CCl4-induced liver injury, as the ability of the hepatocytes to replenish the enzymes is reduced during liver damage. The observed significant (p<0.05) increase in catalase activity in the CCl4 induced rats in a dose dependent manner when the aqueous extract of J. tanjorensis leaves was administered when compared to the positive control could be attributed to the antioxidant activity of the plant’s aqueous leaf extract. The dose dependent antioxidant activity observed in this study may also be due to bioactive components found in the aqueous extract such as vitamin C, flavonoids and phenolics. The increase in the activity of these antioxidant enzymes suggest that the plant extract possess better antioxidant properties at higher doses than at lower doses. This plant extract may also act by increasing the synthesis of antioxidant enzymes that help scavenge reactive oxygen species or by activating already existing antioxidant enzymes, thus increasing its activity in line with findings of Madubuike et al. . Generally, in this study, it could be seen that the catalase, superoxide dismutase and glutathione peroxidase activities of the group that received carbon tetrachloride alone was clearly compromised when compared to the normal control, however, this observation was reversed on treatment with standard drug and the aqueous extract of J. tanjorensis leaves respectively. The concentration of malondialdehyde (MDA), a lipid peroxidation product is generally used as an index of lipid peroxidation . The concentration of MDA usually rise in experimental animals induced with CCl4 due to high level of free radicals generated by this chemical causing increases in oxidative stress and its associated adverse health effects most especially lipid peroxidation as a result of the imbalance between oxidants and antioxidant . The significant increase observed in the MDA concentration of the positive control which was CCl4 induced but not treated could be attributed to the inability of the antioxidant system to counter the activity of the excessive free radicals generated by the CCl4 which led to elevated levels of lipid peroxidation. The significant (p<0.05) decrease in MDA concentrations observed in the CCl4 induced extract treated groups when compared with positive control could suggest that the aqueous leaves extract is rich in antioxidant properties which might have effectively scavenged the free radicals generated by the CCl4 induction and prevented lipid peroxidation. The extract could have achieved this through the activity of non-enzymatic antioxidants present in the extract or through the induction of antioxidant enzymes depicted by their increased activities . The findings of this study suggest that J. tanjorensis leaves are nutritionally rich and possess abundant anti-oxidant properties that cold effectively ameliorate the effects of oxidative stress caused by excess reactive oxygen species generated by the CCl4, and other free radicals from metabolic reactions and xenobiotics with similar mechanism of actions. The plant extract also contains anti-nutritional factors which could impair bioavailability of some nutrients if consumed in excess. The guide for the care and use of laboratory animals’ procedures were followed in this study as outlined Indian Council of Medical Research . Doughari JH, Human SI, Bennade S, Ndakidemi PA. Phytochemicals as chemotherapeutic agents and antioxidants: Possible solution to the control of antibiotic resistant verocytotoxin producing bacteria. J Med Plants Res 2009; 3: 839- 848. Mahdi AA, Rathore B, Das SK, Paul BN. Comparative studies of different organs of N. arbortristis in modulation of lipid peroxide levels, anti-oxidant content, cytokines and effect on hepatic and renal marker enzymes in experimental rheumatoid arthritis. Book of abstract, 3rd International Symposium on Natural Antioxidants Molecular Mechanisms and Health Effects 2005; 24-29. Tiwari P, Kumar B, Kaur M, Kaur G, Kaur H. Phytochemical screening and extraction: A review. Int Pharm Sci 2011; 1: 98-106. Oyewole IO, Magaji ZJ, Awoyinka OA. Biochemical and toxicological studies of aqueous extract of Tethonia diversifolia (Hemsel) leaves in Wistar albino rats. J Med Plants Res 2012; 1: 30-33. Orhue ES, Idu M, Ataman JE, Ebite LE. Hematological and histopathological studies of Jatropha tanjorensis leave in rabbits. Asian J Biol Sci 2008; 1: 84-89. Omoregie ES, Sisodia BS. In vitro anti-plasmodial activity and cytotoxicity of leaf extract from Jatropha tanjorensis. Pharmacol Online 2011; 2: 656-673. Ahaotu EO, Osuji CN, Nwabueze EU, Ibeh CC. Benefits of Jatropha gossipifolia in Nigeria. Int J Agriculture Biosci 2013; 2: 349-355. Candelario-Jalil E, Mohammed-Al-Dalain S, Le´on Fern´andez OS, Men´endez S, P´erez-Davison G, Merino N, Sam S, Ajamieh HH. Oxidative preconditioning affords protection against carbon tetrachloride-induced glycogen depletion and oxidative stress in rats. J Appl Toxicol 2001; 21: 297-301. Uroko RI, Sangodare RSA, Muhammad KH, Asadu CL. Effect of methanol extract of Abrus precatorius leaves on male Wistar albino rats induced liver damage using carbon tetrachloride (CCl4). J Biol Sci 2015; 15: 116-123. Indian Council of Medical Research. Guidelines for the use of laboratory animals in medical colleges. Indian Council Med Res, New Delhi, India 2001; 3-13. Harborne JB. Phytochemical methods. A guide to modern technique of plant analysis (3rd edn). Chapman and Hall, London 1998; 88-185. Trease GE, Evans MC. Textbook on Pharmacognosy (13th Edn). Bailiere Tandal and Caussel, London 1989; 144-148. Velioglu YS, Mazza G, Gao L, Oomah BD. Antioxidant activity and total phenolics in selected fruits, vegetables and grain products. J Agricultural Food Chem 1998; 4113-4117. Lucas GM, Markaka P. Phytic acids and other phosphorus compounds of beans (Phaseolus vulgaris). J Agricultural Food Chem 1975; 23:13-15. AOAC. Standard official methods of analysis of the association of official analytical chemists (18th Edn). Williams, SW. (Bd. ), Washington DC 2010. Scalar. In: Segregated flow analyzer for analytical process laboratories. Netherland 2000; 45. Pearson D. The chemical analyses of food (7th Edition). Churchill Living Stone, London 1976; 3-4. Falade CO, Ajayi IO, Adeniyi JD, Bolaji MO. Role of patent medicine sellers in home management of childhood malaria: a situational analysis of experience in rural Nigeria. Int Quarterly Community Health Edu 2003; 21: 271-281. Lorke D. A new approach to practical acute toxicity testing. Archiv Toxicol 1983; 54: 275-287. Aebi HE. Catalase. In: Methods of enzymatic analysis. Weinhein, Deerfield Beach, Florida 1983; 273-285. Xin Z, Waterman DF, Henken RM, Harmon RJ. Effects of copper status on neutrophil function, superoxide dismutase and copper distribution in steers. J Diary Sci 1991; 74: 30-78. Ursini F, Maiorino M, Gregolin C. The selenoenzyme phospholipid hydroperoxide glutathione peroxidase. Biochem Biophys 1985; 839: 62-70. Wallin B, Rosengren B, Shertzer HG, Camejo G. Lipoprotein oxidation and measurement of TBARS formation in a single microlitre plate; its use for evaluation of antioxidants. Analytical Biochem 1993; 28: 10-15. IBM Corporation. IBM SPSS statistics for windows, Version 20.0. IBM Corp., Armonk, New York 2011. Danladi J, Abdulsalam A, Timbuak JA, Ahmed SA, Mairiga AA, Dahiru AU. Hepatoprotective effect of black seed (Nigella sativa) oil on carbon tetrachloride (CCl4) induced liver toxicity in adult Wistar rats. J Dental Med Sci 2013; 4: 56-62. Arun KP, Brindha P. Studies on antioxidant and anti-athritic potentials of Jatropha tanjorensis Ellis and Saroja. Int J Pharm Pharm Sci 2012; 4: 136-138. Bello M. Nutrient potentials of underutilis plant species in Nigeria. United Nations University Institute for Natural Resources in Africa 2014; 5: 1-35. Maniyar Y, Bhixavatimath P, Agashikar NV. Antidiarrheal activity of flowers of Ixora Coccinea Linn in rats. J Ayurveda Integr Med 2010; 1: 287-291. Esenwah CN, Ikenebomeh MJ. Processing effects on the nutritional and anti-nutritional contents of African locust bean (Parkia biglobosa Benth) seed. Pak J Nutr 2008; 7: 214-217. Kahkonen MP, Hopia AI, Vuorela HJ, Rauha JP, Pihlaja K, Kujala TS, Heinonen M. Antioxidant activity of plant extracts containing phenol compounds. J Agriculture Food Chem 1999; 47: 3954-3962. Igbinaduwa PO, Usifoh CO, Ugwu CC. Phytochemical analysis and toxicological evaluation of the methanol extract of Jatropha tanjorensis leaf. J Pharm Biores 2011; 8: 86-91. Idu M, Igbafe G, Erhabor J. Anti-anemic activity of Jatropha tanjorensis Ellis and Saroja in rabbits. J Med Plants Studies 2014; 2: 64-72. Weber LW, Boll M, Stampfl A. Hepatotoxicity and mechanism of action of haloalkanes: Carbon tetrachloride as a toxicological model. Crit Rev Toxicol 2003; 3: 105-136. Madubuike KG, Yusuf NO, Robinson ES. Evaluation of the in vitro and in vivo antioxidant potentials of Jatropha tanjorensis methanol leaf extract. Internal J Pharm Phytochem Res 2015; 7: 43-51. Sayyah SG. Studying the relationship between oxidative stress malondialdehyde and B-carotene in the serum of asthmatic patient in Basrah Governorate-Iraq. J Basrah Res Sci 2011; 37: 1-7. Sharma RK, Agarwal A. Role of reactive oxygen species in gynecologic diseases. Reproductive Med Biol 2004; 4: 177-199.